Digital Storytelling In Education: Why care? Telling stories allows us to narrate our experiences. When we hear stories, particularly powerful ones, they tend to stick with us (Rossiter, 2002). We all respond to storytelling, regardless of our backgrounds (Alexander & Levine, 2008). It is not surprising then that using storytelling in the classroom has been a successful pedagogical approach. Different technological tools and programs, such as podcasts, infographics, and other types of presentations, make it easy for instructors to create digital stories (McLellan, 2007). Digital stories weave “the art of telling stories with a variety of digital multimedia, such as images, audio, and video“ (Robin, 2006, p. 1). Stories that are realistic and authentic capture students’ attention and help them listen more actively than they might if they were listening to a lecture. A team of researchers found that the areas of the brain stimulated during lecture are the language processing areas where words are decoded into meaning. After this decoding occurs, nothing else happens. On the other hand, reading or hearing stories activates neural representations of visual and motor experience. When we read or hear stories our brain becomes active in the same way it would as if we were actually having the experience we are hearing or reading about in the story (Speer, Reynolds, Swallow & Zacks, 2009). You can use digital stories as teasers to pique students’ curiosity about a topic or idea or link prior knowledge to new knowledge (Robin, 2006). For example, a digital story about the anatomy and physiology of a heart disorder and how to treat it helps medical students learn. Prior to listening to this story, students may know basic information about the anatomy of the heart, and this story deepens that knowledge. After you have students listen to the story, you can ask them questions about its content (Robin, 2008). You can also use digital stories to communicate the most relevant and crucial aspects of the content you are teaching, since digital stories are generally short. Even a short digital story can assist students with putting new knowledge and skills in context. Delivering content through stories allows learners to “connect new knowledge with lived experience and weave it into existing narratives of meaning” (Rossiter, 2002, p. 1). Setting up conditions that allow students connect new knowledge with existing knowledge helps them learn. In The story factor: Secrets of influence from the art of storytelling, Simmons (2006) explains “Teaching stories help us make sense of new skills in meaningful ways. We never teach a skill that doesn’t have a reason ‘why’“ (p. 16). Using a digital story to provide a reason why or to introduce a larger topic is one way to use stories that inform and instruct. Then, as you become more proficient at using digital storytelling, you can use digital stories to delve more deeply into an issue (Simmons, 2006). To begin creating a digital story, the first step is to write a script that is based on research you have done about your topic (Robin, 2006). Focus on your audience and determine how you will hook them in within the first five-ten seconds of the story. Decide what you want the audience to see. consider the purpose of the story, how it relates to the other content being presented, and how it advances knowledge (Denning, 2004). After you have written your script, you can select which media to use to tell the story in a way that captures people’s emotions and draws them in. Examples of media to select include music, animation, and images (Seven Things, 2007). Be sure to edit your stories carefully and to consider how our students will access them. 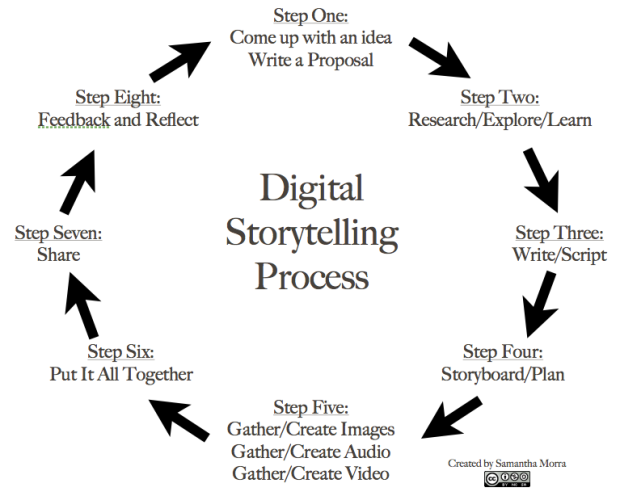 The image below from the University of Houston’s Educational Uses of Digital Storytelling website illustrates the digital storytelling process in eight steps. Image retrieved from University of Houston’s Educational Uses of Digital Storytelling website. You can adopt a range of technological tools to craft your stories. Examples of some of these tools are described below. After you use one of these tools to create your story, you can share the link to the story in Canvas. For more information on using storytelling as a teaching tool, please contact learning designer Jessica Mansbach. Alexander, B., & Levine, A. (2008). Web 2.0 storytelling: Emergence of a new genre. EDUCAUSE review, 43(6), 40-56. Denning, S. (2004). Telling tales. harvard business review, 82(5), 122-129. McLellan, H. (2007). Digital storytelling in higher education. Journal of Computing in Higher Education, 19(1), 65-79. Robin, B. (2008). Digital storytelling: A powerful technology tool for the 21st century classroom. Theory into practice, 47(3), 220-228. Robin, B. (2006). The educational uses of digital storytelling. In Society for Information Technology & Teacher Education International Conference (Vol. 2006, No. 1, pp. 709-716). Rossiter, M. (2002). Narrative and stories in adult teaching and learning. ERIC Clearinghouse on Adult Career and Vocational Education. Simmons, A. (2006). The story factor: Secrets of influence from the art of storytelling. Basic books. Lambert, J. (2013). Digital storytelling: Capturing lives, creating community. Routledge.